With more than 100 of the world’s top brands already at Bal Harbour Shops, the iconic shopping center at the northernmost portion of Miami Beach operates at 100 percent occupancy and with a list of internationally recognized luxury brands waiting to open a store at the premier retail destination, located between Biscayne Bay and the Atlantic Ocean. Although Bal Harbour Shops’ clients are exclusive -­ “We are tenanted by the world’s finest names in luxury and fashion, and, indeed, we accept only the world’s finest names in luxury and fashion,” said Matthew Whitman Lazenby, President and Chief Executive Officer of Whitman Family Development, LLC, which owns Bal Harbour Shops – the renowned, open-air mall requires more space to accommodate its clients’ demands. “Our biggest problem at Bal Harbour Shops is demand in excess of supply,” Lazenby said. “We have a prodigious list of tenants who would be here today if we had the space to accommodate them,” he said. 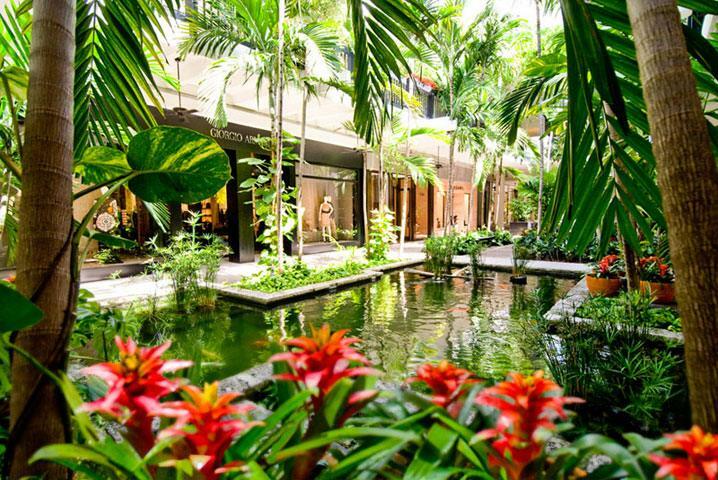 A planned, 250,000-square-foot expansion for Bal Harbour Shops – whose lush, subtropical ambiance includes fish ponds, fountains, palm trees, and fragrant orange trees -­ could be completed as early as 2016, pending approval by the Village of Bal Harbour for plans submitted on Oct. 9, 2013. Bal Harbour Shops and its neighboring Church by the Sea filed joint applications with Bal Harbour Village for two alternative plans. The redevelopment and expansion plans in the first proposal are completely contained within the footprint defined by the current dimensions of Bal Harbour Shops and the Church by the Sea property lines. The second proposal includes property currently owned by the Village and provides for significant infrastructure and aesthetic improvements throughout the Village, at no cost to tax payers, including construction of a new Village Hall, pending approval by local voters. “While these proposals differ substantially in scope, we are very excited about both and are looking forward to hearing comments from the community,” Lazenby said. The type, scale, location and character of the proposed development will be compatible with the surrounding area, aesthetically pleasing, and preserve the character and quality of the existing development, and both of the proposals include the construction of a new church on the northwest portion of the property owned by Bal Harbour Shops. The Church by the Sea, which has been holding services in its current location in Bal Harbour for 65 years, is an integral part of the Bal Harbour Village community. Both plans would expand Bal Harbour Shops’ existing Neiman Marcus store and add a third anchor store. In both plans, the expansion would include 100,000 square feet of additional space for department stores, at least 20 specialty retail boutiques, two new parking garages and a modestly scaled luxury theater — the first movie theater in Bal Harbour Village, the small community that Whitman Family Development Chairman Emeritus Stanley Whitman helped to found in 1946. Whitman, who is Lazenby’s grandfather, founded Bal Harbour Shops in 1965. Billed as a “tiny, magical enclave on the ocean,” it was the first all-luxury fashion retail destination in the United States. By 1971, Whitman had enticed Stanley Marcus to open the first Neiman Marcus store outside of Texas. In 1976, when Saks Fifth Avenue opened at Bal Harbour Shops, the innovative shopping center became the first to include both a Saks Fifth Avenue store and a Neiman Marcus store. In 1978, the fifth Gucci store in the United States opened at Bal Harbour Shops. The world’s most coveted fashion and jewelry brands continued to follow, establishing Bal Harbour Shops as an international standard for luxury retail. In 1983, the shopping center was expanded to its current, 450,000-square-feet dimensions, including a second level, leased under the direction of Whitman’s son, Randall “Randy” Whitman, Chairman of Whitman Family Development, LLC. Like the previous expansions and renovations, the latest planned expansion — estimated at a total investment of about $200 million — is needed to keep Bal Harbour Shops competitive for the next several decades. The latest plans include modifications of initial plans in response to hundreds of comments and suggestions received from village residents during a two-year period of public hearings in Bal Harbour Village. “We have tweaked the plan meaningfully,” Lazenby said, “so it’s responsive to what we heard. We listened carefully. We then empowered a world-class team of architects and design professionals to create a new vision – a vision that incorporated the best of the ideas raised in public hearings and the best practices of urban design,” he said. “The proposals submitted to Bal Harbour Village reflect that vision and further reaffirm Bal Harbour Shops’ on-going commitment to the improvement of the Village and the quality of life for its residents,” Lazenby said. Over the years, Bal Harbour Shops founder Stanley Whitman has been a driving force for improving infrastructure and the quality of life in Bal Harbour Village. He helped form and he chaired the Bal Harbour Resort Tax Committee from its inception in 1968 through 1983. He served five years on the Miami-Dade Water & Sewer Authority, where he shepherded critical sewer and infrastructure improvements to the Village. He conveyed land on 96th street to provide for its expansion to four lanes, and he led the effort to widen Collins Avenue and improve traffic flow. He pushed for Bal Harbour Village signage on I-95 and for the U.S. Post Office to recognize Bal Harbour Village. He searched for innovative ways to fund beach renourishment. Consistently ranked first in retail sales for shopping centers in the United States, Bal Harbour Shops in 2012 was identified by the International Council of Shopping Centers as the world’s most productive shopping center by far, based on annual retail sales per square foot. In 2013, Bal Harbour Shops broke its own record in retail sales. For Bal Harbour Village, Bal Harbour Shops’ success means it’s the largest single payer of property taxes in the Village. At more than $450,000 a year, the Shops’ property taxes represent 10 percent of the total operating budget of the Village. The proposed expansion for the Shops is estimated to increase that amount by 50 percent, to 15 percent of the Village’s annual operating budget. Additionally, the local economic impact of the expansion is projected to be $15 million over the first 10 years. Bal Harbour Shops also generates 91.4 percent of the ½ cent sales tax collections in the Village, 35.9 percent of all personal property taxes, 16.7 percent of the Tourism Tax revenue, and 15.5 percent of the utility and telecom taxes. Bal Harbour Shops’ international reputation as a unique luxury retail destination also boots real estate values in the Village. The average residential sale in Bal Harbour is $450,000 – $600,000 higher than in neighboring communities. The latest plans for expansion of Bal Harbour Shops were developed by Miami-based Zyscovitch Architects and Leo A. Daly Architects in consultation with architects Mark Hampton and Maria Sellek, who initially designed Bal Harbour Shops and have continued to serve as consultants for all shop additions and renovations in the shopping center over the past several decades. Miami landscape architect Raymond Jungles is designing the outdoor environments for the expansion, to complement the existing design, as well as indoor aesthetics. “Ultimately, we aim to achieve the right mix of different uses, so as to create an enduring – and, ideally, a somewhat unpredictable — place in terms of its tenancies,” Lazenby said. Bal Harbour Shops regularly hosts designer trunk shows, product launches, book signings, and cultural and philanthropic festivities. “While my family’s 50 years of history and heritage on this site hopefully count for something,” Lazenby said, “the real differentiating factor is our location. Situated in the heart of the Greater Miami beaches, directly across from the ocean, the Bal Harbor Shops experience could simply never be replicated,” he said. He credits an increase in international tourism to Miami – especially from Latin America, Russia and Asia – for the expansion of Bal Harbour Shops’ busy season to include the summertime, as well as the traditional winter season. “Miami is a true gateway city,” Lazenby said. “Bal Harbour Shops is fortunate to be in a location ideally suited to take advantage of that fact. We enjoy a real diversity of clientele. Our South American tourist season kicks into high gear in the summer while other tropical shopping destinations bide their time until the season picks up again in the fall, but we just keep on trucking,” he said. “Domestic and international tourism has always been essential to the success of the Shops,” Lazenby added. “Shopping is ranked one of the top tourism attractions in South Florida,” he said.